Alright youguys, I have 19 minutes to blog before the washing machine stops and I have to start ironing while the going is damp and the pressing is easy. Then it's time to make dinner - a healthy one, no less - and relax for what may be the first time this entire manic, burger-fuelled, proofreading-crushed week. 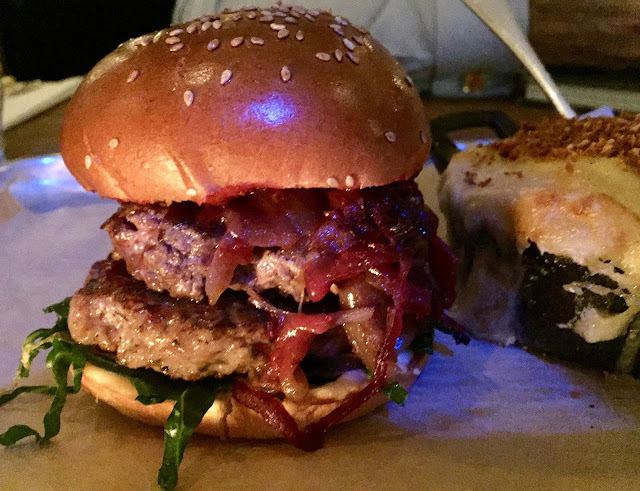 Speaking of burgers, last night we had our last one for the week - this time from Mac and Wild - which was a venison burger with pork stuffing, melted Morangie brie, red cabbage, and shredded sprout tops. This burger - like Hawksmoor's - stands on the power of its perfectly cooked, high quality meat. Which is good, because the red cabbage came on as aggressively as a Roman centurion and there wasn't enough brie to give it a passing fight. I dismantled this entire burger trying to find the cheese, which was the complete opposite of Bad Egg's, where I couldn't find the burger. Like last year, it was a tiny smear, looking much like an anemic swab of mayo, and its stinginess irritated me almost as much as the three million corporate Christmas parties hollering at the tables around us. But we more than made up for it with the haggis macaroni and cheese, and will definitely be returning for their regular burgers at another, less festive time of year.